How Did That Get in the Bible? Here’s the link to the audio of a discussion of similarities and differences between Catholicism and Protestantism that I, Jeff Morrow (Catholic) had with my dear friend Paul Anderson, an evangelical Protestant minister. Bible 101 by Dr. Biff Rocha. This talk is both on how to study the bible and how to lead a bible study. It was given at a retreat to a group of Catholic students at the University of Dayton. 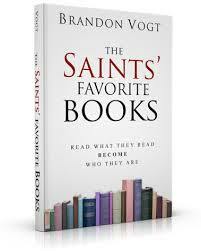 Very recently I got my free electronic copy of Brandon Vogt’s newest book, The Saints’ Favorite Books, and I must say, this is a deal you don’t want to miss! It’s short, but well worth the read, and it’s available for a limited time free here. Brandon walks through many significant Saints, and Popes, throughout Christian history, and he shares what their favorite book was (or, in some instances, where they don’t say what their favorite book was, he makes a good case for which was one of their top books). He also provides links where you can acquire the books yourselves. This is a great way to start a great reading list, following the lead of the Saints and Popes. I highly recommend getting your free copy now. From the same author/blogger as Theologian Mom, comes a relatively new but increasingly popular blog called Parenting Mortification. This is a very useful blog for any parent, or anyone giving spiritual guidance to parents, on how to embrace, creatively and fruitfully, the many little and big crosses that come our way naturally as parents, and turning them into spiritual means of nourishment—-turning them into prayer (as mortifications), thus growing closer to God through them, and helping others with them. She advertises the blog as, “Parenting spirituality for Catholic moms and dads…who sometimes find it hard.” There’s some great stuff here, and especially helpful for Lent. We are pleased to include this blog among our Friends. Here’s a blog of interest to keep an eye on: Theologian Mom, accessible by clinking on that link or at: http://theologianmom.com/. The blogger/author is a stay at home mother with a Ph.D. in Theology. She posts on her family life, on theology, theological and spiritual texts, theological and spiritual issues as they relate to current events and especially marriage and family life. As she writes at the top of her blog: “‘You will be a better mom because you are a theologian, and a better theologian because you are a mom.’ Is it true? In this blog, I explore the interplay and intersection of motherhood and theologianhood.” Enjoy.